Tuberculous meningitis is also known as TB meningitis or tubercular meningitis. 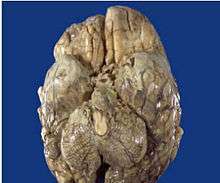 Tuberculous meningitis is Mycobacterium tuberculosis infection of the meninges—the system of membranes which envelop the central nervous system. Fever and headache are the cardinal features, confusion is a late feature and coma bears a poor prognosis. Meningism is absent in a fifth of patients with TB meningitis. Patients may also have focal neurological deficits. Mycobacterium tuberculosis of the meninges is the cardinal feature and the inflammation is concentrated towards the base of the brain. When the inflammation is in the brain stem subarachnoid area, cranial nerve roots may be affected. The symptoms will mimic those of space-occupying lesions. Blood-borne spread certainly occurs, presumably by crossing the blood–brain barrier; but a proportion of patients may get TB meningitis from rupture of a cortical focus in the brain; an even smaller proportion get it from rupture of a bony focus in the spine. The pathophysiology of tuberculous meningitis has bacilli root itself to the brain parenchyma, which causes the formation of small subpial focus. Then there is an increase in size of Rich focus until rupture. 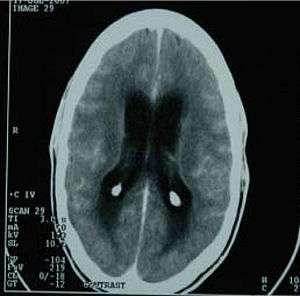 Tubercles rupture in subarachnoid area causes meningitis. Diagnosis of TB meningitis is made by analysing cerebrospinal fluid collected by lumbar puncture. When collecting CSF for suspected TB meningitis, a minimum of 1ml of fluid should be taken (preferably 5 to 10ml). The CSF usually has a high protein, low glucose and a raised number of lymphocytes. Acid-fast bacilli are sometimes seen on a CSF smear, but more commonly, M. tuberculosis is grown in culture. A spiderweb clot in the collected CSF is characteristic of TB meningitis, but is a rare finding. ELISPOT testing is not useful for the diagnosis of acute TB meningitis and is often false negative, but may paradoxically become positive after treatment has started, which helps to confirm the diagnosis. This is a group of tests that use polymerase chain reaction (PCR) to detect mycobacterial nucleic acid. These test vary in which nucleic acid sequence they detect and vary in their accuracy. The two most common commercially available tests are the amplified mycobacterium tuberculosis direct test (MTD, Gen-Probe) and Amplicor. In 2007, review concluded that for diagnosing tuberculous meningitis "Individually, the AMTD test appears to perform the best (sensitivity 74% and specificity 98%)", they found the pooled prevalence of TB meningitis to be 29%. The treatment of TB meningitis is isoniazid, rifampicin, pyrazinamide and ethambutol for two months, followed by isoniazid and rifampicin alone for a further ten months. Steroids help reduce the risk of death in those without HIV. Steroids can be used in the first six weeks of treatment, A few people may require immunomodulatory agents such as thalidomide. Hydrocephalus occurs as a complication in about a third of people with TB meningitis. The addition of aspirin may reduce or delay mortality, possibly by reducing complications such as infarcts. ↑ "Meningitis - tuberculous: MedlinePlus Medical Encyclopedia". www.nlm.nih.gov. Retrieved 2015-06-02. ↑ "Tuberculous Meningitis -- Medical Definition". www.medilexicon.com. Retrieved 2015-06-02. ↑ Harman, Robin J.; Mason, Pamela (2002-01-01). Handbook of Pharmacy Healthcare: Diseases and Patient Advice. Pharmaceutical Press. p. 93. ISBN 9780853695073. ↑ Leach, Richard M. (2010-06-11). Acute and Critical Care Medicine at a Glance. John Wiley & Sons. p. 101. ISBN 9781444327229. ↑ Christodoulides, Myron (2013). Meningitis: Cellular and Molecular Basis. CABI. p. 154. ISBN 9781780641621. ↑ Nicoll, J. A. R.; Bone, Ian; Graham, David (2006-11-24). Adams & Graham's Introduction to Neuropathology 3Ed. CRC Press. p. 127. ISBN 9780340811979. ↑ Behera, D. (2010). Textbook of Pulmonary Medicine. Jaypee Brothers Publishers. p. 505. ISBN 9788184487497. ↑ "Tuberculous Meningitis: Background, Pathophysiology, Etiology". ↑ "Cerebral spinal fluid (CSF) collection: MedlinePlus Medical Encyclopedia". www.nlm.nih.gov. Retrieved 2015-06-02. ↑ Irani, David N. (2008). Cerebrospinal Fluid in Clinical Practice. Elsevier Health Sciences. p. 196. ISBN 1416029087. ↑ Gram-Positive Bacterial Infections: Advances in Research and Treatment: 2011 Edition. ScholarlyEditions. 2012-01-09. p. 77. ISBN 9781464929717. ↑ "The PCR-Based Diagnosis of Central Nervous System Tuberculosis: Up to Date". www.hindawi.com. Retrieved 2015-06-02. ↑ "CDC |TB | ...the Uses of Nucleic Acid Amplification Tests for the Diagnosis of TB: Background". www.cdc.gov. Retrieved 2015-06-02. ↑ Dinnes J, Deeks J, Kunst H, Gibson A, Cummins E, Waugh N, Drobniewski F, Lalvani A (2007). "A systematic review of rapid diagnostic tests for the detection of tuberculosis infection". Health Technol Assess. 11 (3): 85, 87. doi:10.3310/hta11030. PMID 17266837. ↑ Barnett, Anthony H. (2006). Diabetes: Best Practice & Research Compendium. Elsevier Health Sciences. p. 146. ISBN 0323044018. ↑ Prasad, Kameshwar; Singh, Mamta B; Ryan, Hannah (28 April 2016). "Corticosteroids for managing tuberculous meningitis". Cochrane Database of Systematic Reviews. John Wiley & Sons, Ltd. doi:10.1002/14651858.cd002244.pub4. Retrieved 29 April 2016. ↑ Harrison, James; Kulkarni, Kunal; Baguneid, Mohamed; Prendergast, Bernard (2009). Oxford Handbook of Key Clinical Evidence. OUP Oxford. p. 336. ISBN 9780199234073. ↑ Central Nervous System Bacterial Infections—Advances in Research and Treatment: 2012 Edition: ScholarlyBrief. ScholarlyEditions. 2012-12-26. p. 28. ISBN 9781481616232. ↑ "Management of hydrocephalus in patients with tuberculous meningitis Rajshekhar V Neurol India". www.neurologyindia.com. Retrieved 2015-06-02. ↑ Meningitis: New Insights for the Healthcare Professional: 2011 Edition: ScholarlyBrief. ScholarlyEditions. 2012-01-09. p. 2. ISBN 9781464905292.